Based on Porro prism optical scheme, the Futurus binoculars feature compact dimensions. A wide space between optical axes of the right and left optical channels provides better three-dimensionality as compared with binoculars designed on other optical schemes. The Eclipse™ lens caps are incorporated in the Futurus' protective rubber armor body to prevent their loss. The objective lens caps can be thrown back on the binoculars' body, fitting closely on it without disturbing observation. The lens caps rotate for 360 degrees about the optical axis. The cap can be fixed in open position inside of the body between the optical channels. The Futurus binocular's body is made of shockproof carbon-filled plastic featuring mechanical stability. 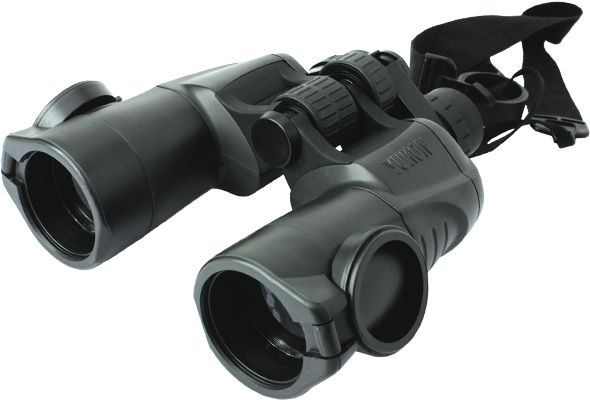 The binoculars’ body is rubber armored, lightweight and compact and guarantees comfortable grip. Moving parts of the binoculars, joints, lens locations have extra moisture protection. Thanks to the IPX4 degree of protection (IEC 60529 standard), the Futurus Pro binoculars can be operated in atmospheric precipitation.